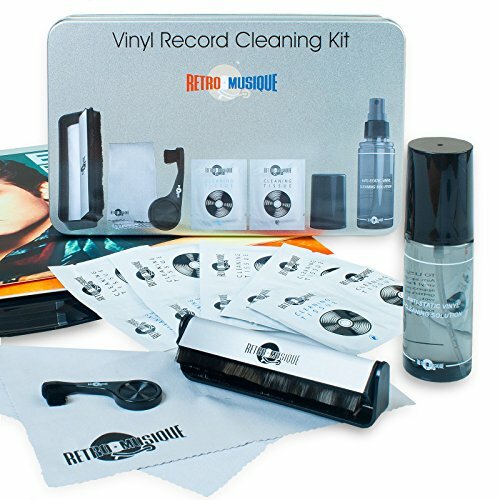 This Vinyl Record Cleaning Kit from Retro Musique is the best solution for the serious vinyl record collector and contains everything you need to keep your vinyl records in tip-top condition and delivering the best possible stereo sound. Dust gathering in the groove of your vinyl distorts the audio quality and is easily removed with the carbon fibre roller brush - an essential and quick way to reduce build-up on the surface of the record. A cleaning fluid atomiser solution, together with a micro-fibre cloth, and wet and dry cleaning tissues will help you to maintain the cleanliness of the record's surface and reduce static build up. A Stylus Needle Cleaning Brush is designed to clean the delicate stylus and those hard to reach places - helping you to enjoy your vinyl fully. Full guidance instructions are included inside this handy tin, which means that all your cleaning tools are stored together. This is the perfect gift for all lovers of vinyl records and turntables! If you have any questions about this product by Retro Musique, contact us by completing and submitting the form below. If you are looking for a specif part number, please include it with your message.